Description A black and white study of a Dendrobium chrysanthum orchid. Information from the internet says it has fragrant yellow flowers with dark red centres [see orchidspecies.com]. The dictionary description says, "Dendrobium. 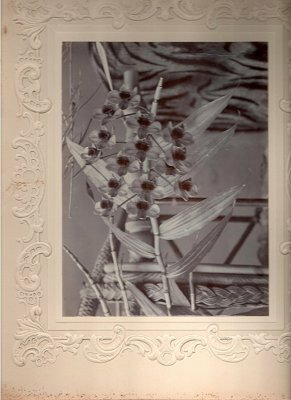 An extensive genus of epiphytic orchids, distributed over the whole of the damp tropical parts of Asia and cultivated in hothouses." 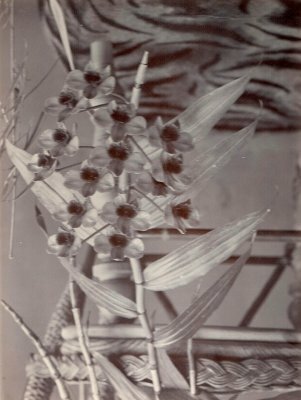 A note on the reverse reads: "Dendrobium Crysantheum, Mr. Chinn". Found in an envelope with "J. Chinn Photography" written on it in the Museum workroom research shelves on 25 August 2009 by Jenny Pierson.